This four-part study is designed to demonstrate, using verbatim transcripts of the tapes of Kenneth Copeland, some of the errors in the "Positive Confession" movement. You may find it hard to believe some of the things Copeland is reported as saying! But trust me, there has been NO tampering with the tapes. Not only did Copeland say these things in the 1980's when this study was first created (as a tape set called "Wells Without Water" on the Banner Ministries tape list) but he continues to reiterate them up to this very moment. So do many, many others in the Word of Faith leadership. These teachers are totally unrepentant of their heresies, despite having been approached by countless brethren who tried to point out their unscriptural teachings. They continue to teach doctrines that are dishonest in their scriptural content, deceptive in their outcome, and destructive to the genuine faith of a Christian. Part One: FORCES OR FRUIT? Below are a number of statements by Kenneth Copeland taken from recordings of his messages. Kenneth Copeland has been chosen because he is the most well-known Positive Confession minister in this country, [England] but the teachings are common to them all. Ministers like Kenneth Hagin, Ray MacCauley, Oral Roberts, Jerry Savelle, and many others, all teach word-for-word the same doctrines you are going to read in this article so the same reasoning applies to them all. All the Word of Faith teachers have these doctrines with very little variation. Now to begin with, some of you may be questioning why anyone sees the need to expose false doctrines in ministries which seem to be so good, so fruitful. After all, the work done around the world by these Word of Faith ministries is enormous. Hundreds of thousands (so they say) are being reached with the gospel, and not only that, but many claim to have been healed and delivered and had their lives totally changed as a result of the Copelands' ministries. It is not my intention to condemn every one of these works as false. If someone has been truly saved or healed, then I thank God for it. 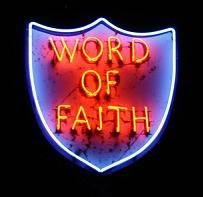 As well as that, I myself have benefited from some of the teaching of the Word of Faith movement. We do need to be positive in our attitude to Scripture. We do need to resist the Devil. We do need to praise God and boldly pray and have faith in God. All that is good. But whatever is good must also be holy and doctrinally correct if it is a Christian ministry. It's not good enough just to be productive or positive or fruitful. We have to be scripturally orthodox. We have to avoid heresy or sooner or later we'll be going down the path of the devil and leading many others by the nose along with us. I can't rejoice that someone is saved simply to be dragged into heresy. God forbid. So I believe where error exists we ought to expose it. If, after reading this article, you are not convinced, I beg you to keep an open mind and to go to God in earnest prayer about it. Ask Him to show you the truth. So, first of all, we're going to review a few quotes from a tape called "The Forces of the Recreated Human Spirit" by Ken Copeland. This is a message that has appeared numerous times in his teachings and in his magazine. Copeland: "…and the power of God toward you provided certain things…Now, we're going to be talking about the major forces that are alive inside the re-born human spirit. We're going to find out what these forces are, and then find out how to release each one of them. Each one of these forces is alive on the inside of the human heart that has been reborn of God…"
Now, notice the subtle change here. Copeland rightly says that the power of God brings us alive in our spirit, but then he says the result is that some forces are imparted there which we need to learn to release. Right away we've stopped depending on the Holy Spirit for power, and we've started looking for a technique to use what WE now possess. But, as a Christian, we have nothing that we have not been given by God. Our spirits DO have powers of course, but Adam proved that those powers, if he used them himself, only led him AWAY from God and into sin. Some witches and satanists have learned how to release supernatural forces in their spirit, but it's done nothing but damage to themselves and to others. Copeland: "These forces that are residing in there are there for a purpose. We find the force of the Faith, we'll find the force of Righteousness, we'll find the force of Wisdom, and we'll find the force of the Love of God. Now, there is something that I want to say right here…Eternal life is imparted to a human spirit when a man makes Jesus Christ the Lord of his life. "Eternal Life" - that's what the Bible calls this power force, that causes a miracle. Actually, it works a good deal…the…the way it's formed up in my mind, the illustration, the picture, the Lord's pictures that are in my mind about it, would be just like injecting a life force of some kind into a man's heart." This again is a subtle change. It takes us away from God and toward our own "godhood". Life is certainly given to man when he's born again. When you receive Jesus, you receive LIFE; that's why. Because HE HIMSELF is Life. The Bible says, in 1 John 5:11, "The life is in the Son; he who has the Son has life; he who has not the Son has not life". And, in John 17:3, we read "and this is eternal life: that they know Thee, the only true God, and Jesus Christ whom Thou has sent". What IS eternal life then? IS it a power force that's "injected into us" when we accept God, like electricity? No. Eternal life, ALL true life is God. God is life. There IS no true life apart from God. We come alive only because God Himself takes up residence in our spirit. As He promises in John 16:23, "If a man love me, my Father will love him, and We will come to him and make Our home with him". We HAVE nothing, we ARE nothing, and we can DO nothing. We are DEAD unless God comes by His Holy Spirit to take up residence within. And THEN do we have something? No! All we have, actually, is a privileged relationship to the One who has everything. We can boast of NOTHING. We have no power, except the power of the Holy Spirit - and that doesn't belong to us at all. Copeland: "And, what I'd like to really get into is some of these areas about how this force of eternal life (that includes these forces that I've named off here to you - the major forces) how this can be used in our daily lives." Copeland: "And they asked us to pray and so we did. And I laid hands on her and the Lord spoke to me, just as I laid my hands on her, and I never would have thought of this, I wouldn't have thought of it in a hundred years. It's just something, you know, some of those things of God, they just never enter our thinking unless He puts them there, because we think so low. We think so carnally…think on such a low level, you see, compared to the way God thinks, and actually the way He intended MAN to think. And just as I laid hands on her, I started to pray and pray this: I started to say 'God - I want You to use Your healing power and I want You to heal my little sister's mind, and heal her brain'. See, actually, (and now think with me just a little bit)…you are a spirit, you have a soul, and you live in a body. Now your mind, you see, the mind is in that spirit-man, and the brain is the housing. The brain is the physical housing of the mind. Can you see that? The brain is the physical housing, that's where the mind lives. That's the physical organ that the mind operates in, that's where the mind and the body come together. All right? He said this to me, He said 'There's no use to you even praying that!'. I said 'Well, huh! Why?'. I said 'Well WHY don't I need that kind of a miracle?!'. He said 'Isn't she born again?'. I said 'Yes sir', you know, that's what the book says. He said 'She's GOT 90% of it there that she's not even USING!' And I saw it! I saw it! He said 'You pray, and you believe God', and He said 'I will rise up on the inside of her'. He said 'Tell her parents to feed her with the Word, and to teach her the Word, and feed her the Word and indoctrinate her on the Word of God - the living Word of Faith - and cause her to live and operate the Faith and let that eternal life that is residing in her open up the 90% of her brain, her mind…' and so forth, '…and mental capacities that are not even being used yet', He said, 'and she'll be smarter than anybody 'coz they're still only operating on about 10 percent'." Now, there are several points here. He says some alarming things. For instance, that if we learn to use these spirit forces, we can operate in the spirit world just as God does. Presumably, we could create new worlds! And if THAT isn't becoming gods, I don't know what is. And then he says "the mind is the spirit and it lives in the physical housing of the brain". Now that's seriously wrong, and it's surprising how many Christians make this mistake. No, the mind IS NOT the human spirit, as Copeland claims. Put a mind to sleep, and rational thought stops - but the spirit of man is still alive and active! There's something FAR deeper than a mind in a man. Somebody can lay in a coma - brain dead to all outward appearances, but something in them is alive, and it's sometimes revived. That deeper being is the spirit of man, and it's MUCH deeper than your mind. Haven't you ever sensed that? Your mind told you one thing, but something deeper told you otherwise. God wants us to be SPIRITUAL, not psychic. What's the difference? Well, if all you've got to rely on is your mind then you're in trouble. But God commands us to be ruled by the Holy Spirit. To walk with Him. To be alive in the Spirit to His guidance. Let's look at just one Scripture that shows this difference… 1 Corinthians 14:14&15. Paul says "If I pray in a tongue my spirit prays, but my mind is unfruitful. What am I to do? I will pray with the spirit, and I will pray with the mind ALSO". There's a difference there, isn't there - between the spirit and the mind? Our minds are to do with the earthly life, but our SPIRITS are to do with heavenly things. The powers of the mind are soulish, psychic. But SPIRITUAL power comes from God the Holy Spirit. That's the only way we can have power - in union with the Holy Spirit…moving in HIS will, under HIS direction. Not just as WE think or imagine. Also, I want you to consider what Copeland said about the capacity of our brains. Isn't it curious that what the LORD told him is in fact nothing less than New Age propaganda? As far as I've been able to discover, there's been NO real, reliable scientific experiment to discover how much of our brain we use. How could you ever measure it? As far as doctors know, we use MANY different parts of our brain all at the same time. God gave us our brains, and we use them. Is God so inefficient that, after thousands upon thousands of years of human history, we are still only utilising a very small portion of our brains? If you have ever watched medical documentaries on TV, showing brain scans, you will have noticed how many different areas of the brain are active. I'm sure we COULD stretch our intellects more than we do, but as for having 90 percent of our brain capacity still vacant…that's unscientific. And it's one of those so-called "facts" put about by New-Agers to induce us to develop mind powers. They want us to get into all sorts of mental exercises, like meditation, to try and "tap" the hidden resources of our minds. They're asking us to unleash psychic forces - the hidden powers of the mind. But is Kenneth Copeland teaching the same thing, when he locates the mind in the reborn spirit? Is he actually asking us to learn how to use the forces of the MIND, and not walk in the Spirit - as the Scripture commands. And secondly, isn't it wicked, really, that here is this little girl (three or four or five - that's all) and she's denied the healing of God because God (supposedly) is asking her, at that age, to confess the Word and live in the Spirit sufficiently to develop the hidden resources of her brain. If her brain is damaged in one area, there's NO WAY that she'll restore that area by confessing scriptures - even if she could be trained somehow to do that.. She needs a miracle of healing. But, according to Copeland, she DOESN'T need one, and she's denied it - on the basis of what HE hears from God. Copeland: "Then, in Galatians 5:16 'This I say then: walk in the Spirit and you shall not fulfil the lusts of the flesh'. Now we're talking about the spirit and the flesh; we're NOT talking about the Holy Spirit…He doesn't HAVE any flesh… You see that? We're talking about the recreated HUMAN spirit. Now, actually you see, in the Greek text there are not any capital letters - and that's where the problem comes in. The translator's put capitals in the English text at their own discretion. It's not in the Greek text. You can't read the Greek Bible and tell the difference between your spirit and the Holy Spirit unless you know what you're reading. Because there are not any capitals there to do that. Now that was capitalized at the privilege of the translators. Now notice what He says…for in the 17th verse: "For the flesh lusteth against the spirit, and the spirit against the flesh. These are contrary the one to the other so that you cannot do the things that you would." Well the Holy Ghost's not lusting against your flesh! Is he? He's not. The Bible didn't say 'When the Spirit of Lust comes". Now we see result of the previous teaching, because now he's re-translated Galatians 5:16 to mean that we walk by the desires, or forces, of our own spirit, instead of God's spirit. "Walk by the Spirit" now means, according to Copeland - walk BY YOUR OWN HUMAN SPIRIT! And he misunderstands the word translated "lust". It simply means "desires". God's Spirit certainly has lusts in THAT sense… He has MANY desires: for you to walk righteously, and so on. But our flesh RESISTS those intentions. That's what Galatians 5:17 means…we resist God. And verse 22: "But the fruit of the Spirit" - contrasts with the flesh. Is this the fruit produced by YOUR human spirit, or is it the fruit of the Spirit of God? And see verse 25: "If we live by the Spirit, let us also walk by the Spirit" - it's the same as verse 16, which Kenneth Copeland said was your human spirit. But did we really come alive by our human spirit? Or was it by the Spirit of God? You see, he's WRONG when he says it's OUR spirit; he's trying to prove that these forces belong to US, not to God. God doesn't seem to figure much in Copeland's philosophy. God is simply the Agency who makes it POSSIBLE for us to have power…THEN we go out and use it. But, really, Christian living is ALL ABOUT God, because without God's leading we don't know what to do, what to say, where to go - without the direction of God's Holy Spirit we are totally sunk because we will only fulfil (as the scripture says) the desires of our FLESH, which as opposed to God's Holy Spirit. Copeland is speaking here of forces that WE have and that WE learn to use. Who's in control here? Is it God? Or is it man? Who's ruling the body…is it God, or is it man? Who is making the decisions? Is it God, or man? And can we REALLY assume that God wants us to utterly victorious in EVERY circumstance according to OUR way of thinking? Was Paul victorious, according to human reasoning, when he was being beaten and imprisoned? It didn't seem so. He should have used these forces to escape persecution. And was Jesus always victorious according to man's way of thinking? It didn't seem so. But He was following a higher way than man's way. God's direction doesn't always get us out of trouble or suffering. Sometimes we're called to endure suffering, in order to grow as Christians. Copeland: "For the law of the Spirit of Life, in Christ Jesus, has made me FREE from the law of sin and death." Now that is the major heading title of these forces: The Law of the Spirit of Life. That's the head law. Down under that we have these sub-titles: The Force of Faith, the Force of Righteousness, the Force of Wisdom, and the Force of Love. Now these things that we have read here in the fifth chapter of Galatians, all of these forces come under one or the other of those major four. […] It's impossible to please God without faith. And so what we need to do, see, is learn how to operate the Faith one, then we can put that one into operation, by faith we will learn how to activate the other three! [my emphasis] Now, faith is born in a human heart at the time of conversion…ALL these forces are. Let's turn over to the Book of Ephesians. Now, from the Book of Ephesians, in the 2nd chapter and the 8th verse, look at this: 'For, by grace are ye saved…', in other words, the force of faith did it. '…that not of yourselves…" - now that force wasn't IN there when you got saved. The grace of God had to PUT it in there - as a gift. I'll read the rest of the verse: '…and that not of yourselves, it is the gift of God'. Hallelujah! What? Just the grace? No! That faith! The force of faith that God had done." In Romans 4:2, we read "Abraham believed God, and it was counted unto him as righteousness". And verse 5 says "To him that worketh not but believeth on Him that justifies the ungodly, his faith is counted as righteousness". So it's clear then, that saving faith is BELIEVING GOD. Abraham was given certain promises by God, and he believed them. It wasn't a force, or an injection of power. He exercised faith in believing what God had said. When we hear the gospel, and believe the Word of God, we're doing the same thing. We're exercising faith. How did these people, not converted in the classic New Testament way (for Jesus had not yet died) come to have faith? Copeland says this "force" is not given until a man is converted! He says: "now that force wasn't IN there when you got saved. The grace of God had to PUT it in there - as a gift." How then does a man get saved? Copeland says the force of faith does it. But is that correct? Is what he says even LOGICAL? Think about it - he says above that "it's impossible to please God without faith" but then that God does not give us "the force of faith" until we are converted! Logically, if that "force" doesn't enter into us until we're converted, how in the world is anyone to be saved?! It's as if I said to you "You can have my house as soon as you live in it, but you can't come in until you own my house"… it's that ridiculous. Romans 10 shows us how we're saved: Verse 9 says "we confess with our mouth the Lord Jesus, and believe in our heart God has raised Him from the dead". Verse 10 says "with the heart man believeth". With the MIND? No! With the HEART. Some will argue that there is saving faith that is given to us to bring us to God - we are drawn by the Holy Spirit for no one can come to Jesus for salvation unless the Father draws him. ( John 6:44) They will say that Copeland is referring to the gift of faith for salvation in Eph 2:8 "For by grace are ye saved through faith; and that not of yourselves: it is the gift of God"
Yet even this is WRONG! The Greek construction of the scripture does not allow for it. The GIFT is not FAITH - but SALVATION. "By grace are ye saved, through faith in Christ. This is a true doctrine, and continues to be essential to the salvation of man to the end of the world. But whether are we to understand, faith or salvation as being the gift of God? This question is answered by the Greek text: tee gar chariti este sesoosmenoi dia tees pisteoos; kai touto ouk ex humoon; Theou to dooron, ouk ex ergoon; hina mee tis kaucheeseetai. By this grace ye are saved through faith; and THIS (touto (grk 5124), this salvation) not of you; it is the gift of God, not of works: so that no one can boast." "The relative touto (grk 5124), this, which is in the neuter gender, cannot stand for pistis (grk 4102), faith, which is the feminine; but it has the whole sentence that goes before for its antecedent." But it may be asked: Is not faith the gift of God? Yes, as to the grace by which it is produced; but the grace or power to believe, and the act of believing, are two different things. Without the grace or power to believe no man ever did or can believe; but with that power the act of faith is a man's own. God never believes for any man, no more than he repents for him; the penitent, through this grace enabling him, believes for himself---; the power to believe may be present long before it is exercised, else, why the solemn warnings with which we meet everywhere in the word of God, and threatenings against those who do not believe? Is not this a proof that such persons have the power but do not use it? They believe not, and therefore are not established. This, therefore, is the true state of the case: God gives the power, man uses the power thus given, and brings glory to God: without the power no one can believe; with it, any one may." The Bible does speak of a spiritual GIFT of faith, but that is something else again. In 1 Corinthians 12:9 for example it's speaking of a specific work of God in a believer, a manifestation of the Holy Spirit in a mature Christian leading to works of God. The gift of faith in that sense is a gift or administration of the Holy Spirit. But saving faith is our response to the promises of God in Christ. It isn't a power or a force. Copeland: "Now watch this; 'And what is the exceeding greatness of His power to us-ward who believe? ', 'what is the exceeding greatness of His power to us-ward who believe?' - now here's what power He's talking about - 'according to the working of His mighty power which He wrought in Christ when He raised Him from the dead and set Him at His own right hand in heavenly places far above every all principality, power, and right dominion, …, not only in this world, but also in that which is to come, and has put all things under His feet'. Now, He has said here, you see, 'What is that power to us', what is it? The power of the cross to us-ward who believe - that's what he wrote over in 1 Corinthians you see. And he said 'that power that He worked when he raised Jesus from the dead' (you see, that started in Hell didn't it? Jesus was in Hell when God raised Him up, He wasn't in that tomb, He was in Hell. That started there.) The power which He wrought in Christ…He was made to be sin for us. Something had to be done about that. That great and mighty power that God worked; He wrought it, He worked it, in Christ when He raised Him from the dead, and made Him alive, and raised Him up into a heavenly place. (Now that's from the bottom to the top. The very bottom to the very top.) And made Him sit in heavenly places, far above ALL dominion, far above ALL principality, over ALL power, and made what? Then He says 'What is that power which He worked in Christ, when He did that, what does it do toward us who believe?' It's the SAME power which he wrought in Him, see? He worked THAT power in Him. 'What is that power…', he says, '…that was worked in us'? What he says: it did us the same way." Copeland asks "What IS this power, this force? And how did it get into us? And what does it do?" That leads us almost into our next subject, which is the spiritual death of Jesus, and the result of that death. The Copelands and the other Word of Faith ministers believe that Jesus took the very sin-nature of the Devil, and died spiritually, so that the Father had to bring Him alive in Hell. We'll go into that teaching next. But you can see that he's saying here that these forces which God gave to us are the same ones He gave to Jesus. Just as God raised Jesus, and He became the first born-again man Copeland says, just in the same way, God raises US and gives us the same power to live. So Jesus is a sort of prototype, (they call this The Pattern Son - an old Latter Rain term) and now we can all be the same as Him, because, when WE believe the Word of God, we get the same injection of power as Jesus. But what the Bible actually teaches, is that Jesus, because of His perfection and sinlessness, defeated Death on our behalf, and consequently He rose again to be our Lord and Saviour. Nobody else has done that. Nobody else will EVER do that again. Salvation is in JESUS; Jesus only. You're not saved in your own right, just because you believed the gospel. You're saved because you've RECEIVED JESUS, and Jesus IS salvation. You've got what He has, only because you're united with Him. One Spirit with Him. Salvation doesn't really belong to you. God is in charge of the powers of life and death, not you. You can't go out and start using power indiscriminately… that's why Paul told us: if we've become alive by the Spirit, then we must WALK in Him. Let your daily walk be controlled by God, not by your own desires. Copeland: "Well if it's the same power, and did the same job on you, when you were dead in your sin trespasses, why would it have gotten weaker in you? It's still there! The force, then, of Faith is the major life-force residing on the inside of the reborn, recreated, human spirit. God put it there, by His grace. And it is still there. The Bible says that Jesus is "the Author" of our faith. He offered it; you have enough. There's enough faith on the inside of you right now to do anything you'll ever need on this earth. Now, I want to go ahead and share this with you; it won't take but about a minute. I got this coming to the class today. I was driving along there, thinking about this, you know, the force of faith…the power of God. Did you know Heaven operates on that force? That IS the predominant force that Heaven operates on. OUR predominant force is the force of electricity. The centre of all of our atoms and so forth are electronically controlled. You know, if you studied physics at school you know that. The neutrons, and the proteins [sic] and all that, you know, and there's electrical field, and that even your physical body, you see, functions and operates on electricity. And you can tell it too; you can build a lot of it up and then get it static charged across the floor and then 'Zap!' - there's some electricity in there. That's the predominant force in the natural world, and faith is akin to it in the spirit world. That's the predominant force there. And it originally came out of the heart of God. And it's predominant there. I find this part just amazing. Not only do we have some kind of power source inside us which seems to have very little to do with God, and which WE must learn to feed and release. Not only that, but now we learn that this energy source is a kind of "superior electricity" that's used in Heaven. And it's going to power the Holy City during the Millennium. Copeland makes it quite plain that it's an energy source, not Jesus living is us, that gives us life and power. He says this force of faith can run cars and power cities. And where does it come from? Out of the heart of God. Now, God's power and love DO flow from His heart, but they're not impersonal energy sources. God IS love, God IS life. His love is an expression of Himself, just as Jesus is the Word of God - God's Word visibly expressed. Well, even MORE so, we can't say that faith originally came out of the heart of God, because faith requires an object of belief… you have to believe IN something. What did God believe in?! Himself? Creation? Mankind? No. Faith was born when it became necessary for us to believe in God, for support and love, and protection and guidance and so on. Faith is man's response to God's promises, not an impersonal energy source. What is it that will light the City of God? It's God's glory. It will be lit by the glory of God, simply because Jesus is there. God's power belongs to God. There may, perhaps, be spiritual powers that operate in a way similar to electricity, but mankind has no business using them. Satan would LOVE for us to discover spiritual power, and he'd turn it against God just as he did long ago. It is satan that is teaching man to develop power outside of God. He wants mankind to be able to overthrow God's throne, and set HIM up - satan - as the King. Copeland is treading a very dangerous path here. Well, in part two, we'll look at this teaching of "Jesus died spiritually", and we'll see just how central this teaching is to the Word of Faith doctrine. We've seen how man supposedly has spirit forces inside him, but next we're going to find out just how they got there, and why Copeland believes that you can do anything you want with the power of faith. 1Thes 5:23 And the very God of peace sanctify you wholly; and I pray God your whole spirit and soul and body be preserved blameless unto the coming of our Lord Jesus Christ. 1 Cor 14:14-15 For if I pray in an unknown tongue, my spirit prayeth, but my understanding is unfruitful. What is it then? I will pray with the spirit, and I will pray with the understanding also: I will sing with the spirit, and I will sing with the understanding also. Job 33:27-30 He looketh upon men, and if any say, I have sinned, and perverted that which was right, and it profited me not; He will deliver his soul from going into the pit, and his life shall see the light. Lo, all these things worketh God oftentimes with man, To bring back his soul from the pit, to be enlightened with the light of the living. Job 33:21-22 His flesh is consumed away, that it cannot be seen; and his bones that were not seen stick out. Yea, his soul draweth near unto the grave, and his life to the destroyers. Ps 16:10-11 For thou wilt not leave my soul in hell; neither wilt thou suffer thine Holy One to see corruption. :1 Cor 6:20 For ye are bought with a price: therefore glorify God in your body, and in your spirit, which are God's.